Great Tween long slouchy sweater. Grey back ground with stripes in various widths and colors of blue, gold,black,green and red. Pockets on the sides. Light weight skit fabric with 3" banding at the bottom. Great for jeans or leggings. 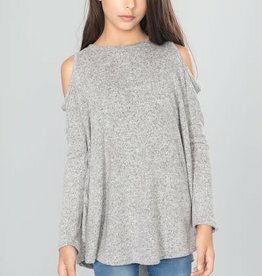 Hacci Long Sleeve, Cold Shoulder top in sm 10, med 12 and large 14. Soft Grey or Burgundy colors to choose from. Coverage on shoulder so bra won't show. Loose fitting so it looks great with jeans and leggings!